Report lost items due to glitches and other things the admins need to come online to fix here. If we accept the problem, we will give a refund when one of us and you both have time. When an issue is solved, it is quoted by the one who solved it. I saw a boat on ice (it was probably on water but it froze) so i got in it, curious to see what would happen. It was just like when you're trying to get out of land. (Slower) So i right clicked to get off and nothing happened (lag) and just spammed my left click to break it. Then, it unlagged and i appered UNDER the ice shelf, and boat broke, and i took the planks with me. I was trying to mine the ice to get up but i didn't have aqua affinity. I DID have an iron pixkaxe, but before I was mining smjjames' ice farm with my silk touch axe, so my brain did: ice is mined with my axe, and i triedd to mine it with my axe, and failed. Yes, I had healing potions but they were drinkables and i had to open my inv, put it on the hot bar, and then close my inv, and drink it, which would not be fast enough. So I'm hoping you can respawn these items. (Btw i got a 15k on score) but you don't have to respawn the healing II drinkables if you don't want to. Try going to the location and picking up the items you lost. I'm not really sure whether it should be considered a bug-death or not. But the items definitely still should be there. Enderman griefing got turned back on somehow. I don't know how to change that property. i never knew we had an enderman plugin. They move grass, dirt, mycelium, clay, sand, gravel, netherrack, melons, pumpkins, cactus, tnt, roses, dandelions and mushrooms. I keep finding griefing all over. It's part of the SafeCreeper suite of functions. I did see one or two holes in the desert that looked like enderman damage, and that dirt block which I mentioned on the thread is certainly from an enderman. anyway's inb4 an enderman picks up mycerlium, and then teleports all the way to mainland, dropping it on a non-dirt area. Did someone take stuff from my chests between when I was on last night and this morning? Because I'm missing at least a stack of redstone and four diamonds. I was having some kind of inventory glitch with the diamonds when I logged out last night to fix it (but didn't log back in), so I could have lost them due to the glitch. I don't care that much about the redstone (you could have just asked), but I do want the diamonds back. Edit while typing: Wait a minute, my gold bars and the ore is gone, could someone check the full log of interactions with that chest? It's fully vanilla, there is no log plugins. I can give you the stuff back, but if you want any punishment or anything you'll have to investigate further. Also, hide your valuables. Thanks, this will be investigated by me and Yqt. I had a very minor version of this. The area underground of that was also hollow, but that might have been me, the hole in the ground however, wasn't supposed to be there. Still, it was mostly underground sandstone and wool and lapis. wow 25 more Bla's that's a lot i can only live with 1. * b-ong imagines me in a warlight game against 26 Bla's. I have seen in the logs that several people have taken items from Spawntown in order to duplicate them for when Spawntown is reverted. Burn EVERYTHING you have taken or mined from there within 24 hours or you will be permanently banned from the server. I will check the logs. Looks like a blacraft wide chunk corruption happened. I have the same thing as well, and at least one plugin broke. The chunks also seem to change from time to time, so whatever is going on is still active and doing the randomization. How do you know that at least one plugin broke? I rolled back the entire world. I suspect it is related to the limits on hard drive space which the server is allowed to use, but that's just a guess. Yesterday it couldn't start the server and said "disc quota exceeded", then I deleted a backup and started the server. I now deleted 26 old backups. Anyway venturing into the nether etc. is a very bad idea if you see a glitch like this. You should simply not go on the server, you will obviously only make problems worse, but that is too late now. Well, it wasn't a complete break, the colors and nick for me and Fiah got erased, it still worked for Kipz and Yqt though. The rollback should fix that. It's not rolled back yet, currently it is refusing to do anything because "disc quota exceeded" despite me deleting 27 old backups (~11 GB). So I've contacted Multiplay support. Edit, copy from Ubox forums: I think the problems are fixed. 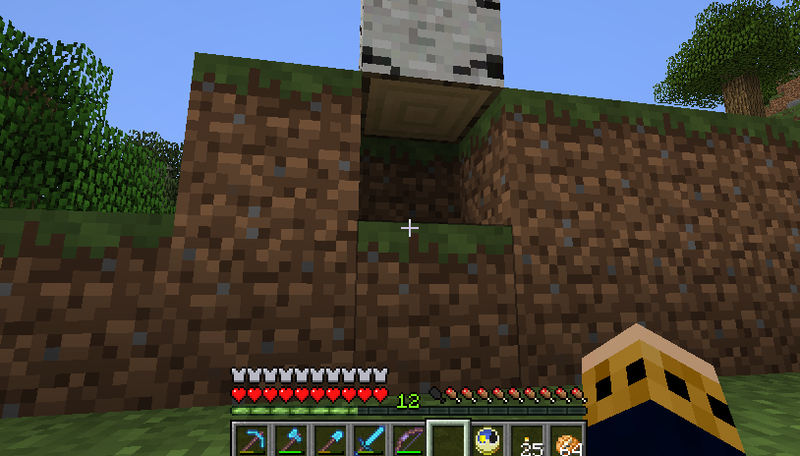 I rolled back to the backup from this morning (which I had expected was taken after the problems you saw, but from what I see, the chunk in smj's farm isn't there, so I guess it works). I haven't checked the Nether yet. If you see any errors like that, it would be useful if you include the coords of it in the future (or take a screenshot with F3 info on). Then I can find it much faster. The OnTime stats seem to have reset. I'll try to fix them. A chunk has apparently been deleted here, and a new one generated, so it doesn't fit into the landscape. Its outer blocks intersect the rail line between Ampluterra Outpost and ****atar (which I was going to change to go through Azecliffs). There's water in the chunk, plus its elevation doesn't fit the surroundings, so it should be easy to spot. It seems like a tiny jungle biome has formed there. Edit: The server seems to crash when entering an area north of that chunk, around (-335 , -850). Might be a corrupted chunk? There were one or two chunks in and near Zuntriio and one to the east of Revolutea in the desert that did the same thing and Yqt fixed. That was a number of months ago though. The chunk probably isn't corrupted if you mean the one on the image, it just got deleted by accident and regenerated I think, and ideally we should put an old one back from a backup. But I think the reason it crashes when going north is probably a corrupted chunk further north yes. Some of them probably wandered from Azecliffs and a few probably come from the chunk with the tiny jungle. This shows many chunks which have been corrupted, using MCEdit on a backup from today. There could be many more errors all over the world. Idk. I have made some maps of the world which show that the chunks are broken in a lot of places, so I have stopped the server to repair the world. The current world is backed up. I will repair it by stitching parts of the current world into a backup from July 21. If you have changed anything in the overworld since then, tell me asap and I will try to move it into the backed up world, or possibly refund you with materials. If you want that rather than losing your progress since then, you should not edit your areas. I will write in here when it is officially recommended to play again. The problems should be fixed, I flew around Spawntown, Ampluterra, Azecliffs, Bongatar and Desertopia, and it all seems as it should. Playing is officially recommended again. Sorry to people who lost progress (I guess you lost some Yqt, since I didn't know what you were doing other than failing at afk'ing in the nether, and calculating the energy you get from eating zombie pigman babies, if you lost important progress we can still restore it). Did my chests get reverted? If not, then basically everything in my inventory got duplicated after some inventory management. If my chests got reverted then I lose nearly 600 quartz, 200 glowstone and a wither skeleton skull. EDIT: I think I did some build work around Capital after July 21st. Yes, everything got reverted outside the areas I wrote. Do you want any chests reverted (if you remember the changes, I think it would be easier if you just destroyed duplicated stuff or give it to yourself unlegitly)? Do you want the areas in Capital to be copied from July 25? 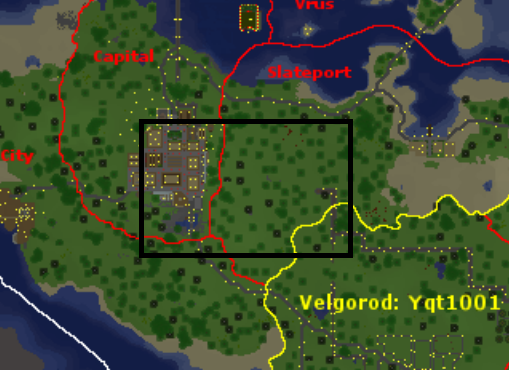 If I could get the areas around Capital reverted to the 25th it'd be better (I also did some work ripping up GLR outside of it to the east too). Tbh I have no idea how much of the resources I actually got. Also, is my player file from yesterday still alive? I lost some pretty decent enchanted armour and using commands and unlegit enchanted books to get it back will take forever. Everything in the world folder (including player files) was backed up about 12-15 hours ago before I rolled back the world, so your player file is still there and you could just drag it from the July 25 world backup into the current world folder using FileZilla to get your armor/inv back. Rollback player files from Yqt and Fiah to July 25. If anyone else needs rollback, please be as specific as possible about what you need rolled back so I can do it while I do this and you won't need to wait any longer for it. Posted both on Blacraft and Universe Sandbox forums. The crudely drawn box is for sure stuff I have changed since July 21st. This includes the GLR (ground light rail, which I am replacing with horse roads eventually ), collective storage (storing of quartz and glowstone) as well as my other storages I used in the past few days. Also, I have the world map GIMP file ready for upload with UYP changes whenever you want it. Taking the server offline now to fix the things. I'll post when it's officially recommended to play on again. Edit: Everything should be fixed now, you can play again. Can I have my player file reverted? I'd do it myself but it takes like 6 hours for me to download the backup. My inventory is still rolledback. However fine I'll spend some time sorting it and spawning things in. Disc quota exceeded again, server is refusing to run. For some reason there's a file called java.core in the folder which has a size of 1.005.105.152 bytes (so 1GB)... I have no idea why it is there and have never seen it before, it says last edited 20130729 03:47:06. I googled the file and didn't find anything. Deleting it. I want to once and for all solve the cactus problem Soviet Japan. I've been thinking about this and then realized that Blacraft has the WorldEdit plugin. So, would it be possible to replace the cactus with air or something? Stuffhappens would probably agree to this as I remember him saying how annoying the catus was. Well, they were put there legitly, so I think it would be a better solution if you used water buckets or placed torches/one-hit-blocks next to them to destroy them, within the municipalities (red areas) that you own. Water doesn't work, we actually tested that, unintentionally. Not sure if torches work though. Honestly though, since me, kipz and yqt did it in the first place, it's probably only fair if we remove some of it. Last time I tried, torches did work. I didn't know water didn't work. But yes, you're welcome to help Bong with it, as long as people agree to what happens to the areas they officially manage on the map. Double checked with water and torches and neither one of them worked. please Bla, can we at least have a poll of using world edit to remove the cati?? No, world editing it isn't an option, sorry. I'm not sure why torches/water doesn't work anymore, I guess burning them or lava doesn't work either. Using slabs would probably take almost as much time as destroying the cactus itself (but you can mine them afterwards so you don't lose them), with an efficiency shovel or such the cacti could probably be destroyed even faster. You could also use sand, because shoveling it can be done pretty fast.